The underground pipes and systems that manage our water and waste go largely unnoticed until there is a problem and you need repairs or you need to call upon a professional for a new installation of one of these systems on a new construction project. Finding someone with experience can always be tough. DiFranco Contractors specializes in repairing and correcting drainage issues. We can quickly diagnose your problem and give you a solution on how it can be corrected. A french drain is usually a surface trench drain or a drain tile set in gravel used to carry water away from a low area or area of pavement. If these drains or pipe are installed properly, they are extremely effective at removing water and drying the area out. To be installed properly, you need a lower area, city storm sewer, road ditch or culvert the water can be diverted to. The pipe installed to carry the water away needs grade or pitch to carry the water away by gravity. Without this grade or pitch, debris can collect in the pipe and eventually clog it. Also, in an area that has a freezing climate in the winter time like Northeast Ohio, if water is laying in the pipe because it doesn’t have the proper grade or pitch, it will freeze thus causing a blockage in the pipe. This pipe work needs to be installed properly in order for it to work properly. Sometimes installing pipe or a drainage system is not necessary for yard drainage. Many times the ground settles years after construction is completed by organic materials like tree stumps and logs decomposing. When this happens, the area or ground settles, leaving low lying areas where water can puddle. Many times, simply grading the area properly will take care of this problem and is much less expensive than installing drainage pipe. In order to determine if this will work properly, the area in question, must be evaluated with a surveying level and a experienced drainage contractor. DiFranco Contractors Inc. is a full service excavation and construction contractor offering new sewer installations and repairs. We can service all sanitary and storm sewers. Camera service is also available to find any compromised areas, so we can do the least amount of digging and save our customers money. Sewer cleaning and jetting services are also available. 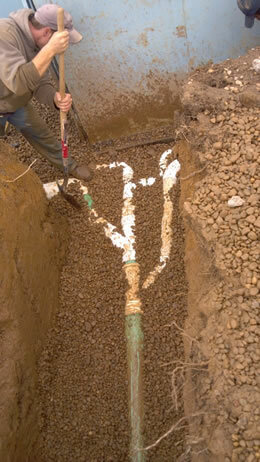 Water lines, both service and main lines are serviced and installed. Water drainage problems can also be corrected such as standing water, water draining the wrong way, and many other problems where water is where you don’t want it. Sump pumps and sewage ejection pumps. Why Choose DiFranco Contractors Inc For Your Sewer and drain Installations? When you choose DiFranco Contractors to provide your sewer installation services you are partnering with experienced professionals. You will deal directly with Gianni DiFranco (owner) with more than 25 years experience. Gianni will consult with you on your project, provide you with your estimate and will be present for the work when your job is scheduled. 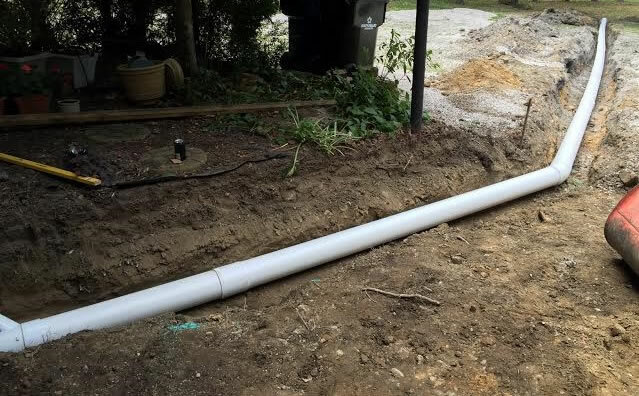 If you’d like to receive an estimate for for Drainage Installation, Drain Tile, Yard Drains or French drains, then please give us a call 440-946-2029 or fill out our contact form and we’ll be getting right back to you.